48. J. Hanckock & Cox pocket watch, Yeovil (Middle Street),Somerset, hallmarked London 1867. Silver Albert chain, hallmarked. This photograph is of Middle Street seen from the Borough and dates to about 1895. Left is London house , at this time being run by George Wadman. 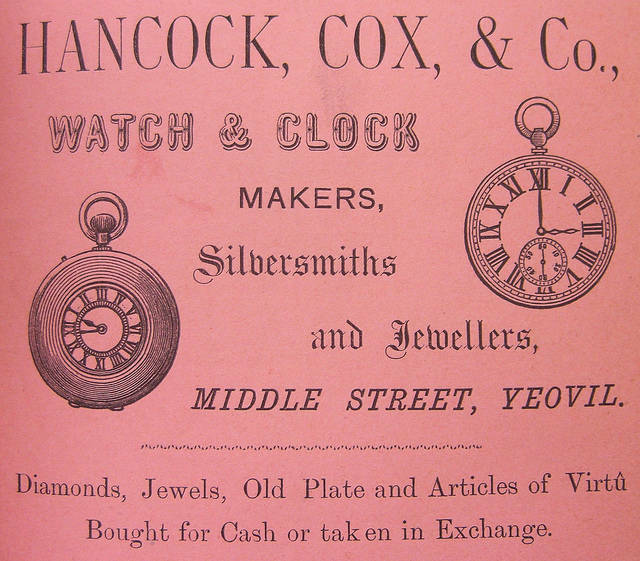 And finally Hancock, Cox & Co, Clock and Watch Makers until about 1894.
a domestic servant. John, James and William Cox all gave their occupations as silversmith. premises with their other sister Mary Cox, her son William Cox and a domestic servant. described as a 'Watchmaker's Assistant' - clearly one of the two men employed by James. directories as, variously, Watchmakers, Clockmakers, Silversmiths and Jewellers. In 1854 the company was listed as Hancock & Co in the Churchwardens' Accounts. from 1855 until the spring of 1862 when James Hancock died at the age of 71.
the company was listed as Hancock, Cox & Co, of Middle Street, until 1894.